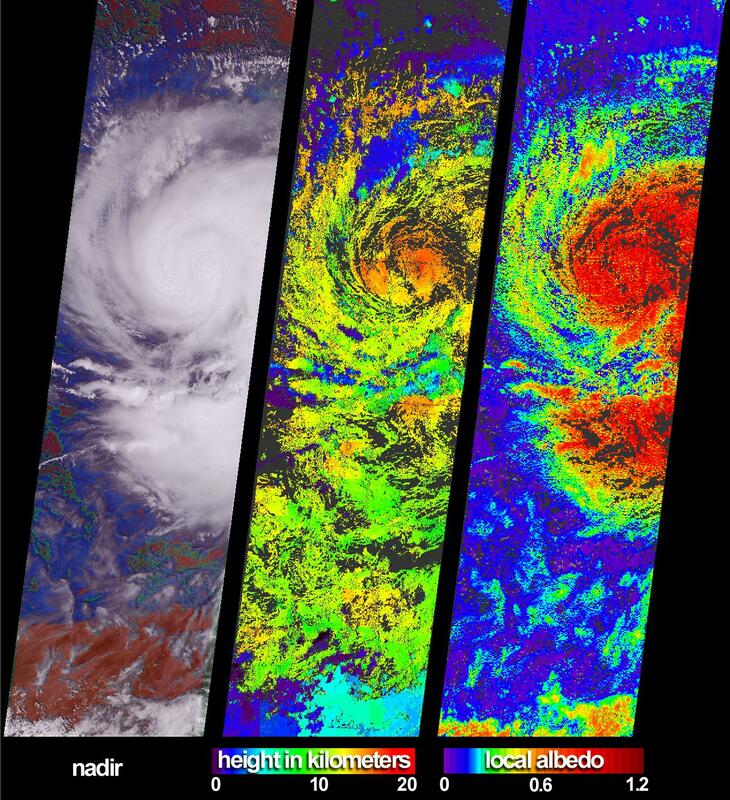 These views of Hurricane Isidore were acquired by the Multi-angle Imaging SpectroRadiometer (MISR) on September 20, 2002. After bringing large-scale flooding to western Cuba, Isidore was upgraded (on September 21) from a tropical storm to a category 3hurricane. Sweeping westward to Mexico's Yucatan Peninsula, the hurricane caused major destruction and left hundreds of thousands of people homeless. Although weakened after passing over the Yucatan landmass, Isidore regained strength as it moved northward over the Gulf of Mexico. At left is a colorful visualization of cloud extent that superimposes MISR's radiometric camera-by-camera cloud mask (RCCM) over natural-color radiance imagery, both derived from data acquired with the instrument's vertical-viewing (nadir) camera. Using brightness and statistical metrics, the RCCM is one of several techniques MISR uses to determine whether an area is clear or cloudy. In this rendition, the RCCM has been color-coded, and purple = cloudy with high confidence, blue = cloudy with low confidence, green = clear with low confidence, and red = clear with high confidence. 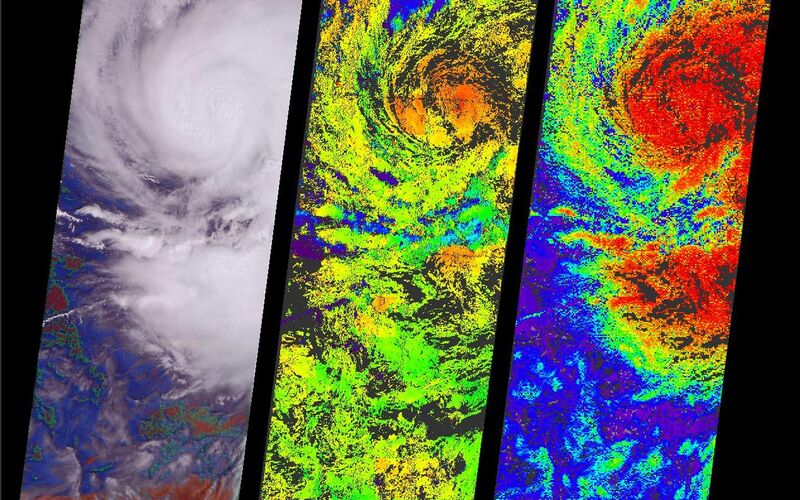 In addition to providing information on meteorological events, MISR's data products are designed to help improve our understanding of the influences of clouds on climate. Cloud heights and albedos are among the variables that govern these influences. (Albedo is the amount of sunlight reflected back to space divided by the amount of incident sunlight.) The center panel is the cloud-top height field retrieved using automated stereoscopic processing of data from multiple MISR cameras. Areas where heights could not be retrieved are shown in dark gray. In some areas, such as the southern portion of the image, the stereo retrieval was able to detect thin, high clouds that were not picked up by the RCCM's nadir view. Retrieved local albedo values for Isidore are shown at right. Generation of the albedo product is dependent upon observed cloud radiances as a function of viewing angle as well as the height field. Note that over the short distances (2.2 kilometers) that the local albedo product is generated, values can be greater than 1.0 due to contributions from cloud sides. Areas where albedo could not be retrieved are shown in dark gray. 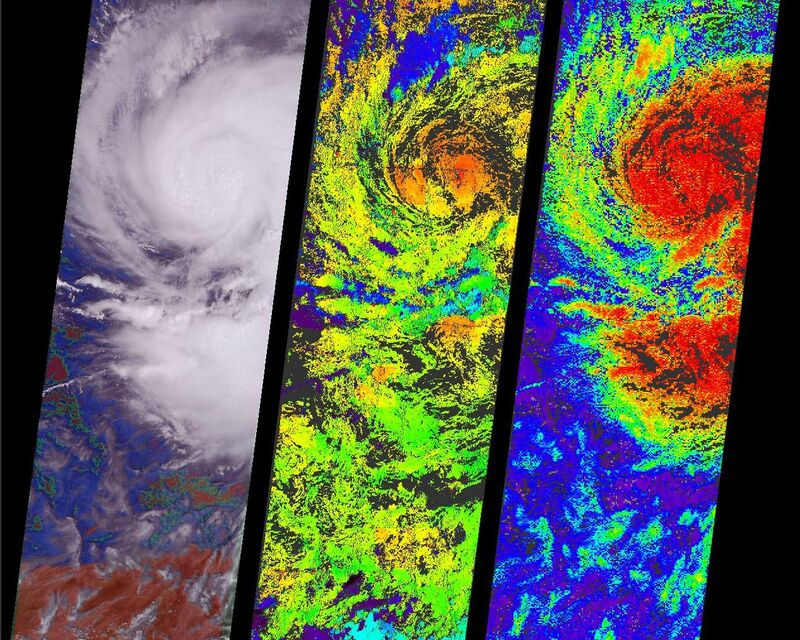 The Multi-angle Imaging SpectroRadiometer observes the daylit Earth continuously from pole to pole, and every 9 days views the entire globe between 82 degrees north and 82 degrees south latitude. These data products were generated from a portion of the imagery acquired during Terra orbit 14669. The panels cover an area of about 380 kilometers x 704 kilometers, and utilize data from blocks 70 to 79within World Reference System-2 path 17.